Suit Nissan Patrol GQ / GU with the later style A/C compressor with a TD42 engine. This bracket has been developed by Patrolapart and is fully AUSTRALIAN MADE. It has been Zinc plated also for rust protection. 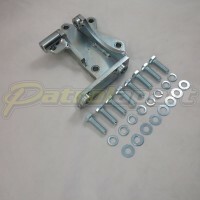 These brackets are hard to find secondhand and it is mainly used for those fitting a GQ TD42 motor into a GU. It uses the compressor that has two vertical mounting holes and two horizontal mounting holes. 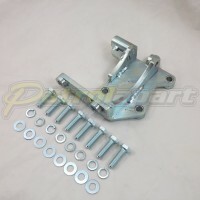 Comes complete with bolts, washers and spring washers to mount to your engine block. These are perfect for doing a TD42 conversion into something like a ZD30 or RD28. Check out the range of parts for this conversion including Brand New Air Con Pumps, ZD30-TD42 Custom made air con hoses, weld on chassis mounts in our online store. Please contact us if you are after any other conversion parts, like secondhand gearbox crossmembers and tail shafts.